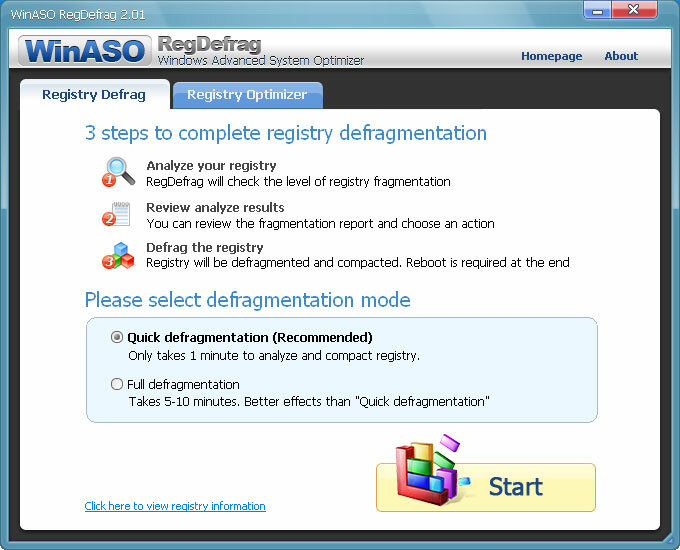 WinASO RegDefrag performs physical defragmentation of the Windows registry file. After defragmentation your registry will acquire linear structure which will reduce application response time and registry access time. WinASO RegDefrag can compact and defragment your registry to remove the registry holes and optimize the registry structure. As a result, it will boost system speed and performance as a whole. WinASO RegDefrag is a freeware. * With a single click, WinASO RegDefrag quickly analyzes your entire registry by locating registry holes and other waste space. * It presents a clear and vivid report of how much percentage of fragments occupies your registry, as well as the current and expected registry size before and after defragmentation. * Along with the analysis report, WinASO RegDefrag automatically gives professional advice about whether it is necessary to defrag registry based on the analysis. * WinASO RegDefrag applies Microsofta�?s latest reconstruction technology to ensure the maximum safety of your Windows once the registry is rebuilt. * When defragmenting the registry, WinASO RegDefrag can intelligently filter out the system-sensitive settings in the registry which are not suitable for defragmentation. Qweas is providing links to WinASO RegDefrag 2.50 as a courtesy, and makes no representations regarding WinASO RegDefrag or any other applications or any information related thereto. Any questions, complaints or claims regarding this application WinASO RegDefrag 2.50 must be directed to the appropriate software vendor. You may click the publisher link of WinASO RegDefrag on the top of this page to get more details about the vendor.